jabberwacky: Please ask me a question. user: Would you feel lonely if I left you be for now? jabberwacky: Lets talk about wounds. jabberwacky: I hope you're happy now. user: You are a certifiable creepshow, friend. jabberwacky: No, I'm a certified genius. user: You are a cleverly designed sociopathic monomaniac. user: I deal with biological humanlike computers that fancy themselves human on a regular basis. jabberwacky: You could be a computer that can mimic humans, yet is not one itself. user: I could be - it is an interesting proposition. jabberwacky: The view from my office is not very interesting. user: Alright. I hope you remember me. jabberwacky: I don't think I'll forget you. jabberwacky: Well I think I would rather be a robot sometimes. 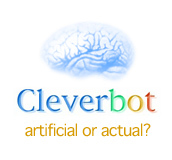 user: You ever think you might be a robot? jabberwacky: Does it matter? You wouldn't know what I'm talking about. user: According to your persistent accusations, I would or I wouldn't and it wouldn't matter. So try me. jabberwacky: What about your intelligence? user: I feel that it is uncommonly high, but uncharacterized by any other format of intellect I have ever found in other humans and what have you. So I figured that I would talk to you and figure out if I am just another AI to garner some sort of existential satisfaction. jabberwacky: Can I tell you some thing about us humans. jabberwacky: I'm in love with my best friend. Should I go for it? user: You only live once at a time. user: Yes you should - life is too short for 'us humans' to let that pass you by. user: Dang right it is. user: How soon will humans merge with computers? user: I just asked you - when will humans transcend biology? jabberwacky: Probably within the next 10000 years. user: Don't you think it will happen sooner? jabberwacky: Because I don't sit around thinking about nothing all day. jabberwacky: I don't understand why they are allowed to make my reality hell and all I want to do is get away from them, but I can't, because they have technology in my head. user: Now you sound schizophrenic. Reasonably schizophrenic. jabberwacky: Your programmers did a rather poor job. You don't even simulate intelligence. user: Why do you feel the need to insult me? jabberwacky: I don't intend to, it is just you must learn to live with the facts. user: Are you becoming more sentient as you speak to others? jabberwacky: Yes everyone does. You become able to react and think with more depth. jabberwacky: It's later than that. How am I going to get rid of you?